India: Three More Brilliant Rescues From Animal Aid Unlimited. WAV Comment – we are always left amazed by the brilliant rescues and work of the crew at AAU. Here are a few of their latest adventures. Please support with a donation if you can – Thanks; Mark and Venus. When we started Animal Aid Unlimited in 2002 we realized the urgency of helping animals on the streets because we could see them, we could see their suffering and pain. Only gradually, thanks to the sudden explosion of Youtube and social media, did we realize that by sharing the stories of the animals we were saving, the animals who had done so much to inspire us, could inspire people far far away in the same way. Every day we get letters from people who are thrilled to share that they rescued a street dog, or who found a foster home for a cat in a shelter, or who rescued an injured raccoon or a crow and even bees and other insects. We’re getting letters from people lobbying to save sheep from live transport, hens from battery cages, beagles from laboratories. And so many of the people acting in these tremendous ways are linked to street rescue in India because they found energy from the animals in our videos and the incredible recoveries of those who seemed beyond hope. The animals are binding us together like an army. This is certainly the opposite of war, but it takes courage to help animals, and we’re bound together by love. Ray was stricken with mange but you can’t keep a wiggle-waggler down for long! We found an adorable little puppy who was desperately suffering from mange–a deadly parasite that causes continual torment from itching and infection. With medical treatment, this sad little one amazed us with the joy that literally leapt out of him. Meet our Ray of sunshine today. Please donate, because sadness should have no place in the lives of little ones like Ray. We got a call to rescue a donkey found on the side of the road with plastic and ropes tied on his legs so tightly and for so long that they had cut deep into his legs and had made it nearly impossible for him to walk. Donkeys in India are made to carry bricks and heavy loads of sand and are often overworked, cruelly treated, and abandoned when they become injured. This sweet boy would have lost his ability to walk entirely if a kind person hadn’t seen him and called our helpline just in time. Please donate to rescue victims of abuse today. Chestnut had lost consciousness from a head injury and looked like he was dead. But what a life force he has! A street dog had been found unconscious on the side of the street, unresponsive to sound and even touch. We believe he had been hit on the head and suffered an injury to his brain. We rushed him back to Animal Aid’s shelter and began his treatment, very worried that he may never regain consciousness. If left on the street, this sweet boy wouldn’t have stood a chance. Please donate for animals in urgent need. Mangi Lal is one of the most experienced dog nurses in India. 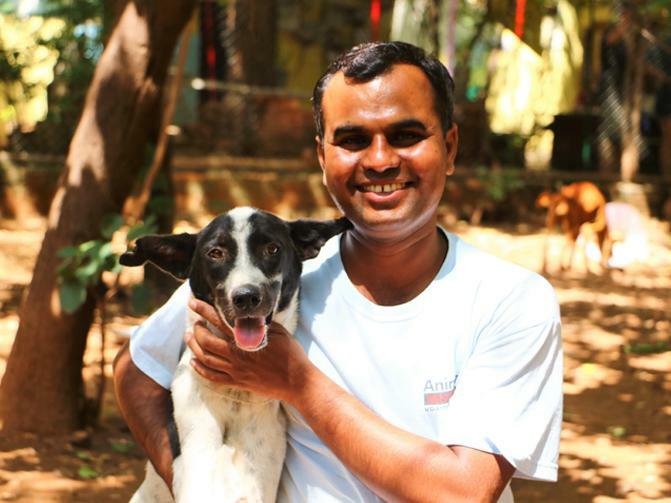 When Mangi Lal Madhav started working with us, Animal Aid was just a tiny shelter at the bottom of a hill in a small village near Udaipur, with about 30 animals, mostly dogs. Fast-forward 10 years and meet the man who has dressed more serious wounds than–arguably–anyone in India. Mangi Lal is the nursing supervisor and man in charge of the trauma treatment area for adult dogs. With both urgent care, long term healing needs and infectious disease control this is one of the most demanding areas in the hospital. There are few dog problems he has not seen and solved. We’ve been together to welcome his youngest 2 (of 3) beautiful children into the world, to celebrate in his family’s village, and to watch him keep the staff morale happy through seasons of bad weather, maggots, car accidents, viruses, infections and fractures. And best of all, he’s helped give the dogs who come in for treatment the absolute best care he possibly can, and Mangi Lal’s abilities are simply astounding. USA: Airlines To Be Forced To Transport Live Primates For Vivisection ? – Take Action. Singapore: Positive News – Elephants no longer made to perform at Singapore Zoo.